The phrase “a strong work ethic” conjures images of hard-driving employees working diligently for long hours. But where did this ideal come from, and how has it been buffeted by changes in work itself? While seemingly rooted in America’s Puritan heritage, perceptions of work ethic have actually undergone multiple transformations over the centuries. And few eras saw a more radical shift in labor ideology than the American industrial age. Daniel T. Rodgers masterfully explores the ways in which the eclipse of small-scale workshops by mechanized production and mass consumption triggered far-reaching shifts in perceptions of labor, leisure, and personal success. He also shows how the new work culture permeated society, including literature, politics, the emerging feminist movement, and the labor movement. A staple of courses in the history of American labor and industrial society, Rodgers’s sharp analysis is sure to find a new audience, as twenty-first-century workers face another shift brought about by technology. 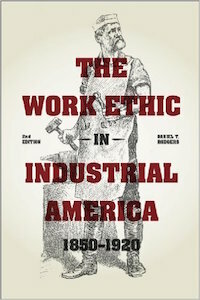 The Work Ethic in Industrial America 1850–1920 is a classic with critical relevance in today’s volatile economic times.